Dwayne Johnson openly discussed his feud with Vin Diesel in a new interview, wishing his co-star the best before 'erasing' the "no ill will" part at the end of his statement, dinging his Fast and Furious co-star in a means to have the last word. Johnson reveals that the two have clarity, "whether we work together again or not," leading many to believe that the actor is finished with the main Fast and Furious franchise. Dwayne Johnson is still working on the Hobbs and Shaw spin-off movie with Jason Statham, which is slated to begin production this fall. 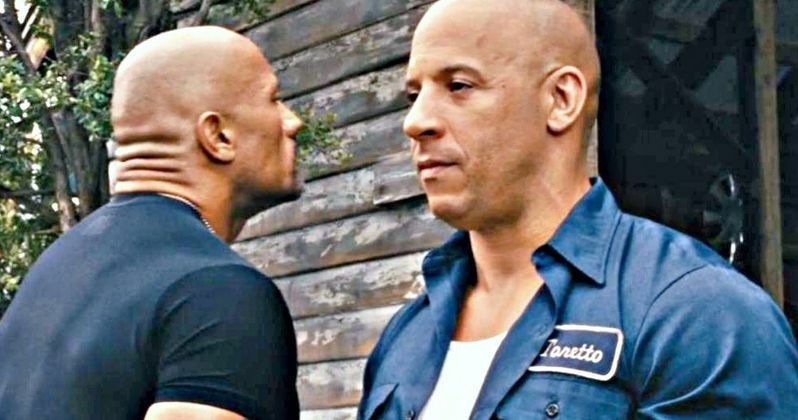 Vin Diesel and Dwayne Johnson had a very public feud over the last year, but it appears that it is now over, according to Johnson. Tensions were reportedly so bad between the two that they wouldn't even film scenes together during The Fate of the Furious. As it turns out, the two action mega stars have a different way of approaching their projects. And ultimately, that means The Rock might not return in Fast & Furious 9, especially with his solo movie on the way. Johnson explains. "Vin (Diesel) and I had a few discussions, including an important face-to-face in my trailer. And what I came to realize is that we have a fundamental difference in philosophies on how we approach moviemaking and collaborating." After their discussions and the benefit of time passing, Dwayne Johnson states that there is no longer a feud between himself and Vin Diesel. But, that doesn't mean everything is all good either. While things have been smoothed out, Johnson is unsure if they'll ever work together again, leading many to speculate that Johnson might not return to the Fast and Furious franchise, instead focusing solely on the Fast and Furious Spin-Off. He had this to say. "It took me some time, but I'm grateful for that clarity. Whether we work together again or not. But I wish him all the best, and I harbor no ill will there, just because of the clarity we have. (laughs) Actually, you can erase that last part about no ill will. We'll just keep it with the clarity." The Fast and Furious franchise would suffer a huge blow if Dwayne Johnson decides not to return. The actor is clearly focused on getting the Hobbs and Shaw spin-off to be the best movie that it can be and is looking forward to working with Jason Statham again. But as far as a return to the proper Fast and Furious franchise, it's not clear if Johnson will return at this time. This could all just be a clever marketing ploy for the immensely popular movie series. Dwayne Johnson previously noted that the tracking for the last movie went through the roof after his feud with Vin Diesel became public. Dwayne Johnson is keeping incredibly busy as usual. Rampage is set to be released in a few weeks with Skyscraper coming out this summer as well. In addition, the actor will begin filming the Jungle Cruise movie this summer before jumping into the production of the Hobbs and Shaw spin-off this fall. You can read more about the Dwayne Johnson's feelings on the Vin Diesel feud and the Fast and Furious franchise at Rolling Stone.